Last week I pleasantly surprised my senses with this spur-of-the-moment, disease-fighting smoothie. Read on to learn why beets and ginger are staples in my medicine cabinet. Beets offer many health benefits due to their numerous antioxidants. For starters, they contain betalains which have anti-inflammatory and antioxidant properties, therefore, promoting cardiovascular and metabolic health. Betalains have even been shown to help suppress tumor growth in studies on multiple cancer cell lines and animal models. Other antioxidants found in beets include manganese, which helps regulate glucose metabolism, and vitamin C (in the greens). Beet greens also contain lutein which is known for maintaining eye health. For women who are pregnant or trying to conceive, beets’ folate, vitamin B and iron content makes this vegetable a worthy smoothie addition. Finally, betaine, an amino acid found in beets, can act as an antidepressant. Ginger has been used as a herbal medicine for years and is currently one of the most researched spices. Last year a study reported that daily ginger consumption lowered fasting blood sugar in those with type 2 diabetes. Previously, a randomized controlled trial demonstrated that ginger decreased cholesterol and triglyceride levels. These promising results demonstrate how beneficial ginger may be for women with PCOS. Add all ingredients to blender and go for a whirl! If it is not blending easily add more coconut water or water. This recipe looks bomb! I need to start making more smoothies since summer is coming around! The colors of the smoothie are so pretty too! Thank you! Smoothies are so quick and easy to take on the go on summer adventures! I love the bright colors! So pretty! This looks so good! The color is incredible! A whole bunch of vitamins! Energy boost is guaranteed! I love beets, such a good veggie for energy! For sure! There have been studies on beet juice improving athletic performance! So cool. Beetroot and ginger, two culinary superheroes! I’ve been putting grated beets on my daily side salad and I’m trawling Pinterest regularly seeking out new ways to use ginger – I just love how it tastes! Mhmm, beets on salad are a great idea. And yes, I love the extra bite ginger adds. I love them for their speed and diversity! Quite gorgeous and healthy too! The color looks amazing! 🙂 So I’m guessing it would have to taste just as great! This looks so bright and colourful and sounds lush! I never would have thought to pair banana with beets and ginger but this looks great. Love the colors! The bright color is just awesome! 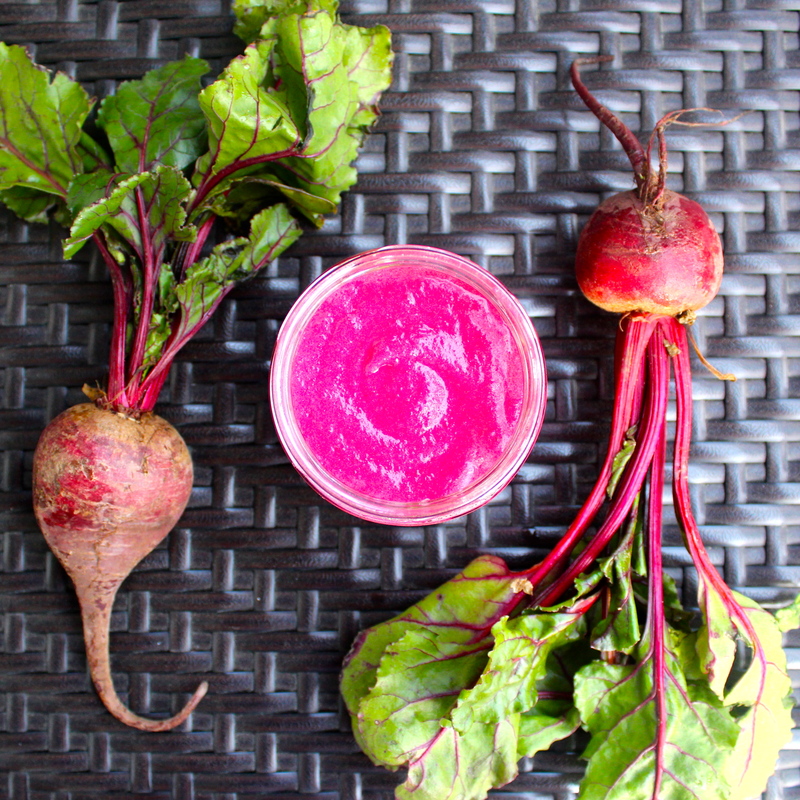 i am planting my own beets this year and can’t wait to give this recipe a go! That is amazing. Home-grown veggies sure taste better, eh? Good luck with the planting and I hope they stay safe from any ravenous animals! The smoothie looks lovely – beautiful color. Would you suggest including the beet greens in the smoothie as well? Hi Diana! I definitely would suggest including beet greens! They have different health benefits then the actual beet. I didn’t include them here so I could achieve the brilliant pink color :P. I guess aesthetics won this round! You gotta try beets!! There are so many ways to eat them (all on the handy-dandy internet). Thanks for the great feedback! I love the protein powder I use. I have tried so many vegan brands and it is the best tasting and cheapest (sweet!). I think I need to grow some beets, and some ginger! Hmm, you could simply omit it and have everything else as is. Or if you are after the protein I also use oats or dairy-free yogurt. 🙂 Thanks for popping by! I am slowly becoming a beet fan and will give this a try. Beets and Ginger are my FAVORITE. I will be more than happy to make this one tomorrow! Thanks! This looks great. I should try it. Now that I am pregnant, smoothies is all I crave! Two of my most favorite vegetables and herbs ever! And what a lovely pink color it came out to be. This looks like something that would be on my blog because I make these types of smoothies everyday! Yum!!! I have never tried beets but I know they are so good for you, I may have to try this! Very nice Information. Will try it. I actually have beetroot juice which is also amazing. This is great!! I love all the health information. That looks so refreshing! A little cafe by my work does a beet, ginger, apple juice and I LOVE it. I love beets in smoothies and juice. The ginger helps with the earthy taste. I’m the only on in this house though. I agree that ginger adds a ton of flavor. I don’t go many days without a bit in my smoothies! What an amazing color that smoothie is, can wait to try it!! Thank you! I love the color too, one of my favorites! I’ve added this to my list and can’t wait to try it! Oh Lala! Super colorfoul and healthy 🙂 I love beet so I’ll definitely try this smoothie recipe.